Taking leaf rubbings is a classic fall activity (and it happens to be a great motor skill developer, what with the holding, grasping and rubbing that’s going on). 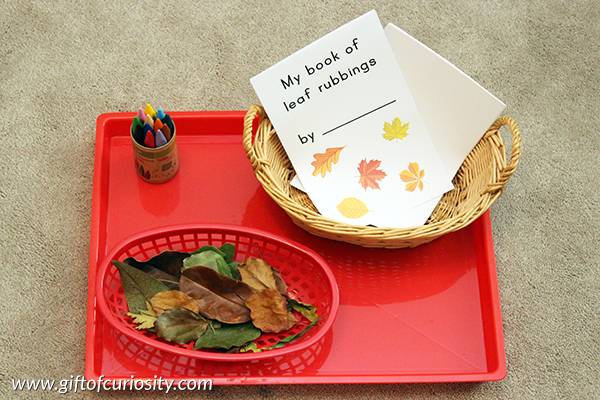 You can make leaf rubbing into a fun activity with this printable book cover and activity ideas from Gift of Curiosity. I could see this taking a whole afternoon, with walking around the yard or the neighborhood to collect leaves, selecting leaves to rub, doing the rubbings and making a book. Or you can keep it on your nature shelf for a child to discover and interact with when they are ready.